In June 2016, Cameron Underwood lost most of his jaw, nose, as well as most of his teeth to a self-inflicted gunshot to the face. 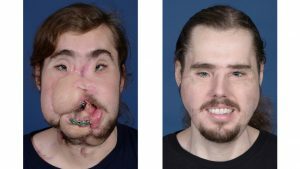 Eighteen months later, on Thursday, he revealed himself to the world as a successful recipient of a face transplant surgery, performed at NYU Langone Health center in Manhattan. “I am so grateful to have a face transplant because it gives me a second chance at life,” Underwood said in a press conference held at the hospital. Cameron Underwood, before and after the surgery. Credit: NYU Langone Health. Face transplants are still a relatively new thing as there have only been about 40 of these surgeries worldwide, and this is only the second one performed at NYU Langone. Underwood’s surgeon was Eduardo D. Rodriguez MD, DDS, Professor of Reconstructive Plastic Surgery and chair of the Hansjorg Wyss Department of Plastic Surgery at NYU Langone. Rodriguez is also responsible for performing a successful face transplant surgery on a Mississippi firefighter, Patrick Hardison, who was horrifically burned in a 2001 fire. Underwood’s case is most unique in its brevity. He spent only six months on the waitlist and after the surgery he spent only 37 days in the hospital, compared to the 62 days post-operation stay of Rodriguez’ first patient. After trying multiple conventional reconstructive surgeries, Underwood’s mother, Beverly Bailey-Potter, contacted Dr. Rodriguez. Bailey-Porter had read about one of Dr. Rodriguez’s previous surgeries, in an article in People Magazine. The Underwood family then traveled from their home in Yuba, California to Manhattan for the surgery, making it the longest distance traveled for a face transplant. Underwood can thank William Fisher, a 23-year-old Manhattan resident and film student at Johns Hopkins University, for his second chance at life. After unexpectedly dying in December of 2017, Fisher’s mother approved her son’s face for transplant, following her son’s wishes. He has been an organ donor since he was a teenager, and also donated his heart, kidneys, liver, eyes, and other tissues. The surgery lasted 25 hours, with the help of more than 100 medical professionals. Three-dimensional computer surgical planning was used, as well as three-dimensional cutting guides. The team reconstructed Underwood’s jaw, teeth, gums, mouth, lower eyelids, cheeks, nose, and nasal passages. “Technical advances have increased our ability to tackle the most complex cases more precisely with maximal aesthetic and functional results,” Dr. Rodriguez said. Beyond being a symbol of technological innovation in the medical field, Underwood’s surgery has set a precedent in terms of medical insurance coverage. His face transplant surgery was the first to be covered by commercial insurance, according to the hospital. The private insurance, provided by his job, covered about a third of the $1.5 million cost of the surgery. The rest was covered by philanthropic and grant funding. Cameron still has to visit his physicians once a month for follow ups and he will remain on anti-rejection medication for the rest of his life. He will otherwise be back to living a normal, if not better, life. He has even gone skydiving since the surgery.